We all saw when Captain America (Chris Evans) gave up his prestigious shield to Tony Stark aka the Iron Man. 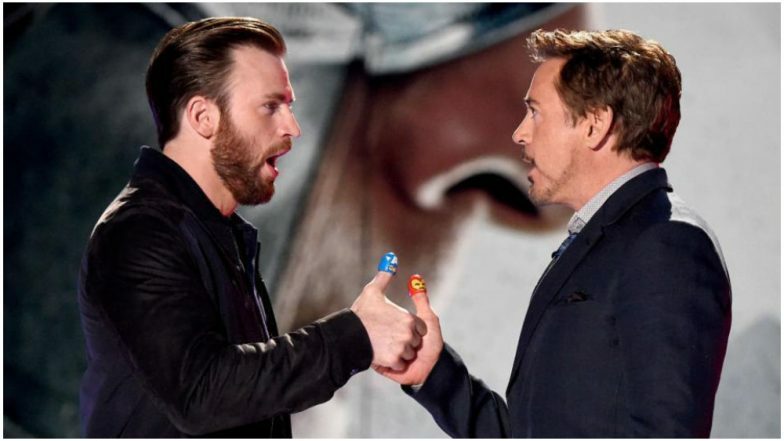 Yes, we went emotional and heartfelt about the tussle war between our two favourite superheroes. Well, it seems that the shield made out of the Wakanda steel is still in Tony Stark’s custody. However, the sad news is, he is still not ready to give it back to its original owner. Robert Downey Jr. shared a funny video on Instagram and we are not liking the idea of it. Robert Downey Jr Falls For Joker's April Fools' Prank! Google India Tweets Video of Marvel's Iron Man Taking on DC's Supervillain in Biggest 'Crossover'. RDJ, took to his Instagram to share video, in which the Captain America shield is placed in the background. The actor, however, confesses that he would return it back to Captain America, but there’s a catch! “Verified #flashback #day1@avengers #press #tour #2019 Sorry Cap! Not today... #hair @davynewkirk#style @jeanneyangstyle (🎥 @jimmy_rich ) #TeamStark#sameasiteverwas,” wrote the actor. Avengers: Endgame is all set to release on April 26. This could be the last MCU film that stars RDJ, Chris Evans, Mark Ruffalo, Chris Hemsworth, Scarlett Johansson, and Jeremy Renner. The anticipation for the movie is sky high and the wait seems a never-ending pain! We sincerely hope that RDJ aka Tony Stark returns the shield back to Captain America, after all, it is a fight against the super-villain Thanos.